Watch Cain Confident He Can Win Nomination, Says Harassment Claims Are 'Baseless' on PBS. See more from PBS NewsHour. As allegations of sexual harassment from the 1990's continue to loom over Herman Cain's campaign this week, the GOP frontrunner is also raising eyebrows with his foreign policy remarks. In an interview Monday, Cain said part of China's threat to the United States stems from its attempts to develop nuclear weapons -- even though China tested its first nuclear weaponin 1964. "Yes, they're a military threat," Cain said on the PBS NewsHour, in response to a question from Judy Woodruff. "They've indicated that they're trying to develop nuclear capability and they want to develop more aircraft carriers like we have. So yes, we have to consider them a military threat." 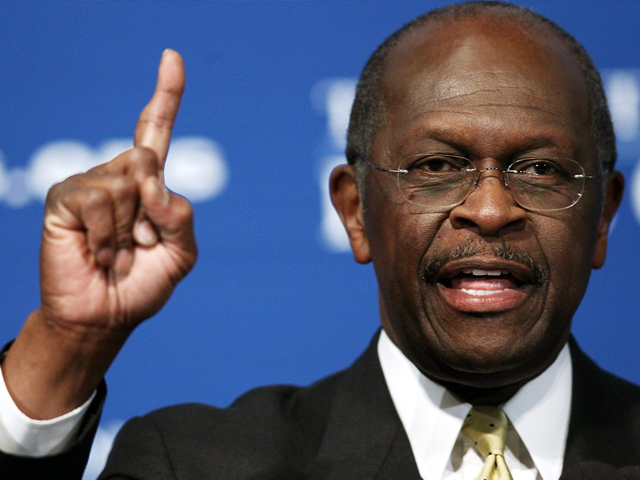 Cain's remarks have in the past raised questions about his foreign policy credentials. Earlier this month, when joking about "gotcha" questions, Cain said, "And when they ask me, 'Who is the president of Ubeki-beki-beki-beki-stan-stan?' I'm going to say you know, 'I don't know. Do you know?' And then I'm going to say, 'How's that going to create one job?'" Cain also took heat from his GOP rivals when he suggested on CNN this month that he would free the prisoners at Guantanamo Bay in a prisoner exchange with terrorists -- a comment he later walked back. With respect to China, Cain told Woodruff that as president, he would advocate "peace through strength and clarity." "We already have superiority in terms of our military capability, and I plan to get away from making cutting our defense a priority and make investing in our military capability a priority," he said. He said the key way to blunt the threat China poses is to improve the economy. "My China strategy is quite simply outgrow China. It gets back to economics," he said on Monday. "China has a $6 trillion economy and they're growing at approximately 10 percent. We have a $14 trillion economy -- much bigger -- but we're growing at an anemic 1.5, 1.6 percent. When we get our economy growing back at the rate of 5 or 6 percent that it has the ability to do, we will outgrow China." Woodruff moved on to questioning Cain about his campaign strategy, overlooking his remarks on China's nuclear capabilities. While his command of foreign policy issues remains a liability, Cain has been under more pressure this week because of revelations that he was accused of sexual harassment in the 1990's, when he was the head of the National Restaurant Association. It's unclear as of yet how the revelations will impact Cain's current frontrunner status.